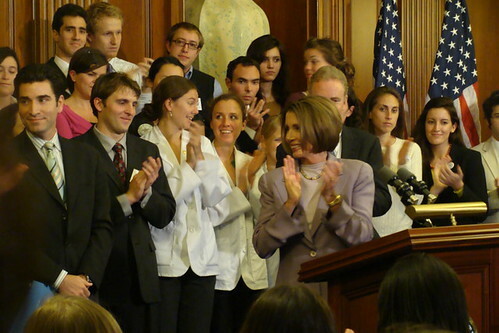 Speaker Nancy Pelosi along with Reps. Chris Van Hollen (D-MD) and Kathy Dahlkemper (D-PA) held a press conference with representatives from several youth organizations in support of the Young Adult Health Coverage Act which allows young Americans remain on their health insurance plan until they turn 26. “Young adults are the most uninsured group in the country. They often lose coverage at age 19 when they graduate from high school or a few years later when they graduate from college. Once they enter the workforce, they face new obstacles to getting insurance. Today, they are speaking out and their voices are being heard. For many weeks, young Americans have added to the call to the chorus for reform. They have offered specific proposals about health insurance reform that works for everyone. Our legislation answers their call by: ending discrimination based on pre-existing medical conditions, capping out-of-pocket costs, focusing on preventive care, investing in workforce training to boost the number of primary care doctors and nurses, creating a health insurance exchange to give Americans a better deal in the individual insurance market, and speaking personally, a public option in the House bill. Today, I’m pleased to announce that our bill will allow young people to stay on their parents’ policy until their 27th birthday if they need it. The Speaker has been a consistent ally to the youth movement, frequently lending her leadership to issues that support my generation. Reps. Van Hollen and Dahlkemper should be proud of their work on something so meaningful in the health care battle.